Happy 8th Birthday Cornish Underground! It feels so good to still be making music and going onto slightly bigger and better things. A learned sound engineer and all round music industry long-stay fellow friend of mine suggested that the momentum of my business was as such that even after closure of certain elements of my work, I would be assured of continued employment in sound. This rang true throughout this year, as some parts of my work stopped, followed by its replacement being bigger and better than its predecessor. This certainly happened with the closure of Black & White Recording Studio. It came in a swift measure, that the owner of the studio chose to move the sound equipment out of the studio and turn the rooms into flats. This was just before my busy period of the festival season and the studio was my rock solid winter income provider, so faced with it’s closure I sought alternative studio’s in the hope of finding a new studio before the end of festival season. First thing to come up was a phone call from a renowned music producer based in Penzance and upon a meeting with him, a place recording and mixing at his studio with his skilled mentoring was promised. We continued our talks and although spending a days session with him in his studio, eventually goal posts moved and after only a short while it fell through. Again, I found myself without a guaranteed winter income. I searched beyond and evaluated the possibility of a few existing facilities to work from and even briefly looked into setting up a studio facility myself from scratch. Thankfully, an opportunity arose to sit in on a session involving some existing musical friends of mine who were guesting on an album. 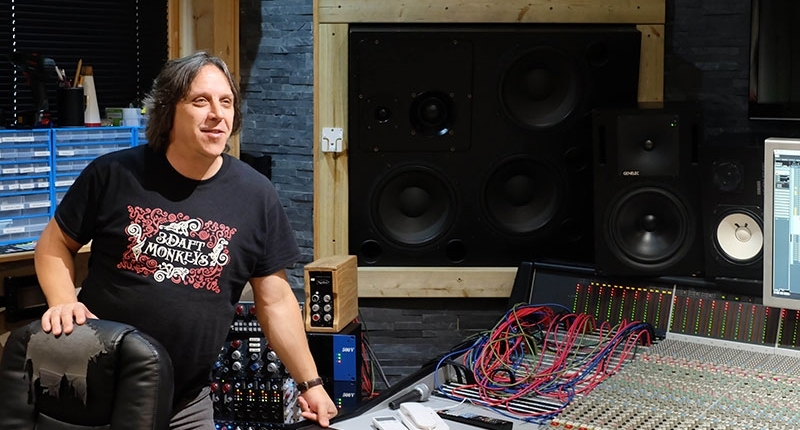 Having had the chance to chat with producer and studio owner Gareth Young, it was soon suggested that I should get involved at Cube Recording. A weeks shadowing of existing producers, and a two day session recording with the Boundless Brothers has now qualified me to use Cube Recording as my base for recording clients. The Cube is in my opinion, one of, if not ‘the’ best studio in Cornwall and for those who know of the studio will know of its prestige. I’m currently redirecting customers that would have recorded with me at Black & White and many more artists, to this new and fantastic studio. Other avenues of work have come into closure, such as the gradual disbanding of the Cornish Celtic Music band Dalla. They had taken a year out of gigging and over the last 12 months have struggled to come back with due force, splitting into separate projects such as Davey & Dyer, Didjan and Hilary’s ‘Shout’ (Cornish singing) books. Dalla as its big band however, will live on in the way of dance band Skillywidden and will still continue to be seen and heard at Nos Lowen events. Following last years success of booking and operating sound for the Melting Pot Cafe’s events, I have arranged to repeat this formula again this coming year. The Melting Pot Cafe has been a good long term involvement of mine and even with new owners Charlie and Tracy, this continues to be so. Bands and gigs booked will be for the period of January to May and encourage gigging at a more quiet time of the gigging calendar. Alongside the Melting Pot, I have been involved in other venues such as the Old Bakery Studios and St Austell’s Cornucopia. It is very exciting to be involved in Truro’s new and well attended venue The Old Bakery Studios. Having been there early on in its development and subsequently helped with their interior acoustics and sound measurements, gigging at this stunningly arty, post industrial, grungy venue has been amazing. A ground floor, durgy, dark, but riotously hot and sweaty grass roots venue is fantastic, where audiences rock out until bedtime. It has a capacity of 300 people and is the perfect home for my NEXO PS15 rig which purrs in this character full venue. Beyond Truro, there is activity with my involvement too, St Austell’s Cornucopia, multi use venue is starting to make headway. A partial shopping arcade / Live music venue is starting to flex its muscles and with a massive 800 – 1000 capacity, this stunning warehouse style facility is starting to put on some bigger acts. Bands like Daytoner and The Allergies feat: Uncle Frank are starting to frequent the venue, with promise of nights Thursday – Saturday being offered with music starting in the new year. This year showed great reward with the recording of Harry Glasson songs, sung by Oggyman Will Keating. This album I am pleased to say was produced by my hand and marks a milestone in my way of working with music. Since the very start of my career, I’ve wished to be in the position of the creative role of producer, making decisions on creative, technical and other content of albums. Will was great to work with and allowed me to add technical note to the student engineers in Falmouth Uni, add the occasional musical anecdote and keep the session running creatively, but efficiently. It was a real pleasure to work with school choirs, the Oggymen, the Helston town band and the RNLI choir, who were also part of another of Will’s projects recorded in Falmouth University and mixed and mastered by me at my home studio Cornish Underground. In return for producing this album, I gifted myself with the new DAW software Cubase Pro 9, which I used for the project and a handful of other mixing software programs and plug-ins. Highlights of this year must be travelling with the 3 Daft Monkeys to Sark Folk Festival on the Channel Islands, crossing La Coupe (look it up!) on little Sark and making a marquee full of 800+ people bounce up and down, going crazy to the music! The Grenaways filming and recording of ‘Rowen’ in Black & White Studio, in memory of Laura’s cousin who sadly passed away. Recordings with Laura Garcia’s band ‘Rowen Tree’ and more recently Salt and Sky, bringing Cornish music and language happily back into my home studio. Memorable gigs with Nessi Gomes, The Little Unsaid, Flats and Sharps, Kernow Vibration and in the studio Eve Goodman and the Boundless Brothers. West African musician Setondji Spirit is soon to mix his project with me, recorded at the lovely chilled roots music festival Tropical Pressure this summer, which in itself was a hit. This year especially, I have noticed a distinct network of professional friends, who are all in the same scene. Those that I see in bands at festivals, or in recording environments, all making up a pattern of professionals, meeting regularly, regardless of geography. It seems that either the field of music professionals shrink when in such a specialist network, or my network continues to grow and grow seeing familiar faces everywhere I travel. Either way, good relationships are being made and are beneficial to the good music being produced. In line with last years plan to make a handful of video’s focusing in on the different areas of my business for marketing purposes, I’ve been working with a young film maker who is now offering live video capture of performances for bands and musicians. I also work alongside him by recording the live audio from gigs either in just stereo, or as a multi-channel recording to mix at a later date. In return for helping him find musical contacts, I have now made 4 video shorts which will help to advertise my business. The year ahead looks rather well healed, as I’ve found new premises to record, a number of new venues to keep me going until festival season and the respectful amount of quality festivals that come back year by year. My business is looking much more robust and secure than it has done at previous times. The potential for my work to reach a bigger and higher quality audience is something that I will embrace. I encourage financial growth from my business in line with the quality of music I can now output on a consistent level. A BIG THANKYOU goes to you one and all for your continued support and fun musical endeavours, thanks to my keen Cornish Underground crew Josh, Rash, Flip, and Cj who keep the music pumping for you. We wish to help you do what you do best, which is to MAKE MUSIC!! So keep it up! See you in the studio, or out there gigging!